167 people bet he would bite again during the World Cup. Social media chatter revolving around Luis Suarez’ bite of Italian player Giorgio Chiellini in a World Cup match have been fierce. In fact, the Uruguayan football star has been banned for 4 months by FIFA and has also been released from his sponsorship duties with 888Poker. But 167 online gamblers at Betsson are not the least bit disappointed in Suarez’ actions. They’ve cashed in on a 175-1 prop bet wager, according to a report by ESPNFC.com, which sourced Betsson SportsBook head Andreas Bardun. The unlikely wager may have seemed like a good way to waste a few dollars to some, but one Norwegian is reported to have earned $3,300 USD from throwing approximately $20 at the long shot. Thomas Syversen, also of Norway, posted a screenshot of his $914 haul on Twitter after wagering a little of $5 (NOK 32 Norwegian Krone) on whether Suarez would bite someone during the 2014 World Cup. All Luis Suarez bets are off for the time being as he sits out his suspension and ponders his next move on the public relations front. One interesting discussion going forward could be the Over/Under for any future Suarez prop bets involving biting. It’s unlikely sports betters will be able to sink their teeth into another 175-1 parlay of Suarez’ actions. JRB isn’t the only one who puts his cash on the line. Regging for the one drop. The 2012 World Series of Poker Main Event Champ, Greg Merson is looking to add more money and titles to his resume. Is The Monster Stack Too Much of a Good Thing? Get a professionals take on the Mini-Main Event. The Monster Stack (aka the “Mini Main”) is an undisputed success – so should the World Series of Poker load up the 2015 schedule with a ton of deepstack bracelet events? Not so fast says Ultimate Poker pro Jeremy Ausmus, the Monster Stack may just be too good to do with any regularity. Having himself hit the poker wall having taken #NoDaysOff this summer, Jeremy thinks that while this is a great event, it may be just too long to play poker for too little money…for most. No one is disputing that the $1.3M up top is amazing, but it’s going to take a least 5 days to get there and most people will be playing for 3 without the guarantee of any cash, you know? Put a really ridiculous beat on a guy where I backdoored a straight vs his 2 pair. After the hand he gave me this odds chart! Nice guy, handled it quite well. So what do you think? Should the WSOP double down on the mini-Main or is there such thing as too much? The 3.5k remaining players come back at 3pm PST today to put in another full day of grinding. Everyone is trying to teach you how to talk like a pro. It’s snowing in the Rio. As Event #50, the 8-Game Mix, steamrolls to a final table, PokerNews's Sarah Grant gets chatty with David “ODB” Baker, the original mixed game gangster. Sure you say certain poker terms that make you sound like you know what you are talking about but there are some in these lesser played mixed games which you should get under your belt otherwise you might just end up in the #showers. Bonus: So you’re a poker NOOB in need some some basic training? We got you. It’s a post within a post! Imagine the scene; your friend that invited you to a poker game says; “Cowboys”, and you have to ask if a pair of Queens is good. As soon as the regulars get wind of your lack of poker vocabulary, unbeknown to you, the words “Fish” begin to flash above your head. Luckily there is plenty of information out. Check out this article introducing a witty scenario and some useful poker vocabulary that even Star Wars fans can appreciate! What’s more is you can turn your opponents into table the donks by going one further spurting out alternative hand names such as Canadian Aces, Anna Kournikova, and Wayne Gretzky – giving your opponents an education in poker vocabulary they may never have had before. John Hennigan captures $1.5M and his 3rd WSOP bracelet. He “fell apart” at the wrong time, but recovered in time for victory. After five long days we finally have a winner in the high-rolling mixed game bonanza that is the $50K Poker Players Championship. John “Johnny World” Hennigan bags his 3rd World Series of Poker bracelet and a cool $1.5+ milly to go along with it pushing his career earnings well overt he $6M mark. Hennigan faced some stiff competition as the players whittled themselves down including runner-up, Brandon Shack-Harris, Brandon Cantu’s arch-enemy Jesse Martin and the out on bail Abe Mosseri. Melissa Burr, the first woman to ever cash in the $50K PPC, wrapped up her historic deep run with a 7th place finish, one better than Allen “Chainsaw” Kessler. Check out his winner’s interview with PokerNews's Sarah Grant where he talks about the emotional highs and lows that go along with battling in such a prestigious tournament. 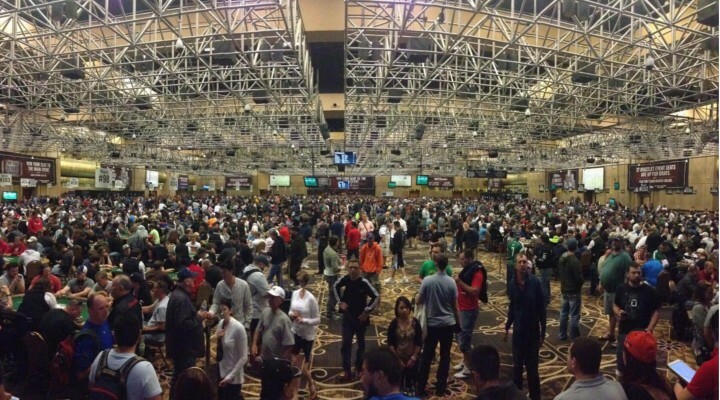 Players descend on the Rio in record numbers. By the time registration ended, Event #51made history. It was the inaugural running of the $1500 Monster Stack event that had everyone in the hallways of the Rio abuzz. And if you were in the hallways of the Rio, you knew that was of a lot of people. The World Series of Poker has finally delivered what the everyday players have been longing for. An event with a long structure and plenty of chips giving amateurs and pros exceptional value for the price and the players loved it. So much in fact they turned out in droves. They turned out in herds. Let’s just call it a mob, as the hallways were literally jam packed with players trying to get from point A to point B. At midnight, the number of entrants read 7862 meaning that the winner of his marathon event, now turned into a 5-day event, will take home upwards of $1.327 Million. Unlike the incredibly successful Millionaire Maker, this field was not a re-entry event, meaning that all of these runners were unique entrants and the total number of players turned this into the third largest tournament in history. The enormity of the event made it so organizers not only added a 2nd flight to restart at 5pm, but then introduced additional flights of late entrants throughout the night as players lined the hallways waiting for their chance to take a seat and run it up. While there were some delays, by all accounts the organizers of the WSOP did an amazing job of getting everyone into the event. This monster field of 3826 surviving players return at 3pm to grind another long day where it’s questionable even if the money will be made. Watch: Tournament Director Jack Effel talks with PokerNews about the debut of the Monster Stack. Maybe we are and maybe we aren’t. It’s a rough life back at the World Series of Poker. It’s more nosebleed tournament action with Episode 2 of the 2014 PCA $100,000 Super High Roller. Another fantastic production of high level poker with Jason Mercier, Dani Stern, Bryn Kenney, John Juanda and Jonathan Duhamel all taking their seats at the featured table and James Hartigan and Joe Stapelton calling the action and cracking the jokes. Want to know the real Doug “WCGRider Polk? What’s his coolest possession? His favorite food? His favorite hand in poker (spoiler: it’s Aces)? Well, wonder about the answers to those (and more!) no longer as PokerNews sat with the nosebleed bracelet winner to just get to know him a little bit better. 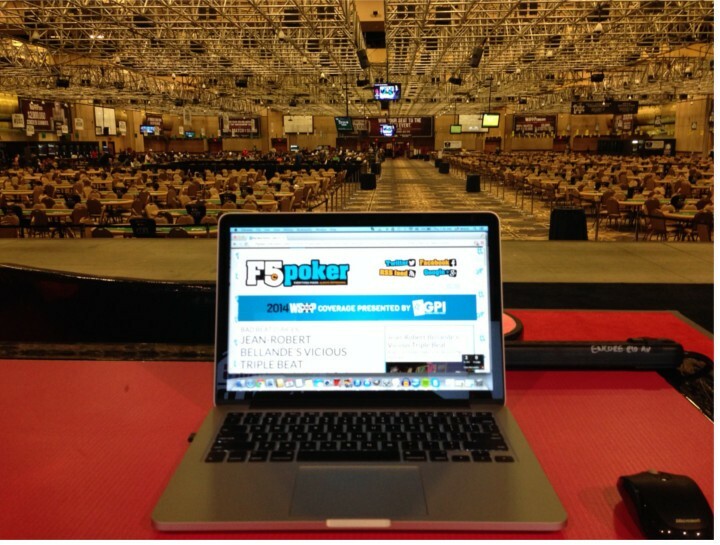 Sitting in an empty Brasilia Room at the Rio, PokerNews editor Pamela Maldonado (we think) peppers Polk with rapid fire random questions to help the public get to know the good time guy behind the high-stakes heads-up specialist. Judge says shuffle up and deal. 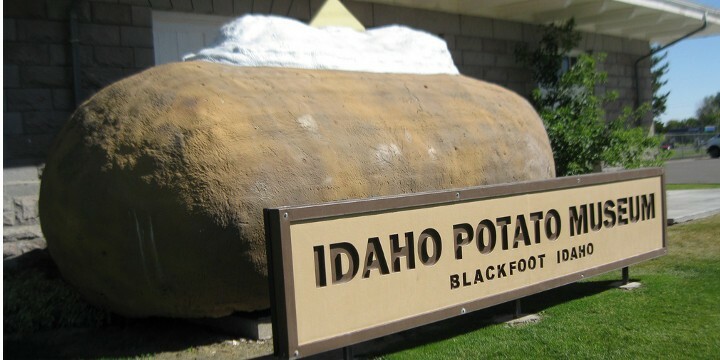 Tribal reps in Idaho argue NLH is a skill game; while Idaho bigwigs say all poker forms are illegal. In the ongoing legal poker case in Idaho, a U.S. District Judge has denied a motion put forward by Idaho state officials to place a temporary ban on a Texas Hold’em poker game played at a Coeur d’Alene Tribe’s casino; a case in which a tribal representative defended the game supporting the popular opinion that Texas Hold’em is a game of skill. The state sued last month to shut down the tribe’s poker room, saying all forms of poker are banned under Idaho’s Constitution and state law. But tribal representatives argued that Texas Hold ‘Em poker is not considered illegal gambling but a game of skill. As there is no house involved in the game, the argument is that no rules have been broken. Originally the state shut the game down claiming it breaks a strict compact stating only approved games involving real money are permitted in tribal casinos; however, it is now the legality of the state official’s actions that have come into question. State officials’ hurried actions to bring a lawsuit against the tribe have backfired after allegedly breaking the compact themselves. The blunder came after officials failed to do their research, which resulted in them filing a lawsuit when instead the compact says each party is supposed to run through a 60-day window with option of arbitration. Unfortunately, for the tribe, the fight is not yet complete. “But the State of Idaho remains committed to enforcing the rule of law that limits gambling in tribal casinos to clearly approved games — and poker isn’t one of them,” Gov. C.L. “Butch” Otter said in a prepared statement. No woman has ever cashed in the Poker Players Championship. Burr eyes history if things go her way. Vanessa Selbst might not be the only history making female at the 2014 World Series of Poker as high-stakes cash game regular Melissa Burr is looking to etch her name in the history books as well. It’s getting super deep in the $50K Poker Players Championship as only 22 come back on Wednesday for Day 4. Melissa is one of them and if she can fade just a few more players and storm in to the cash (only 14 get paid) she’ll find herself the first and only woman to have completed that feat. Here she talks with Remko Rinkema from PokerNews about how the tournament has gone, how she calms her nerves and what it would mean for her to survive the Day 4 money bubble. Kid Poker made a lasting impression. Oh god, the jokes, the jokes. This is what you think it is. Daniel Negreanu has a new signature series of fan. In this photo, this superfan said yes to a Kid Poker lower back tattoo (and nobody even asked.) While there may be another Daniel Negreanu tattoo out there somewhere has anyone ever tattooed the logo of the Rio on themselves? If Philip’s termination was just over this incident, Berende thinks it’s a little harsh. A lot has been said about the rapid termination over the lively World Cup celebration of popular former Team PokerStars Online Pro Dale “Daleroxxu” Philip but while the rest of the world can only read Dale’s blog or watch the video, poker pro Paul Berende was actually there. Berende chats with PokerNews' Frank Op de Woerd about what went down at the UKIPT event in Spain and whether he thinks Dale took his goooooooal celebration to a point past elation into being offensive. Team 888 Pro pretty happy with how life is turning out. Bluff Magazine caught Jesse while at the 2014 WSOP to ask him if the reality on the show was really real. Sylvia tells Bluff that while it took him some time to get comfortable with the camera around, just about everything you saw really happened…even if a conversation or two needed to be re-created so the cameras could capture it. While Jesse isn’t nearly as loose with his cash as the show portrays him to be, he’s still chasing that elusive 2nd big time final table and even grinding a little cash game while he’s at it. River run three times is no help to the Survivor. There are bad beats and there are punches to the gut. 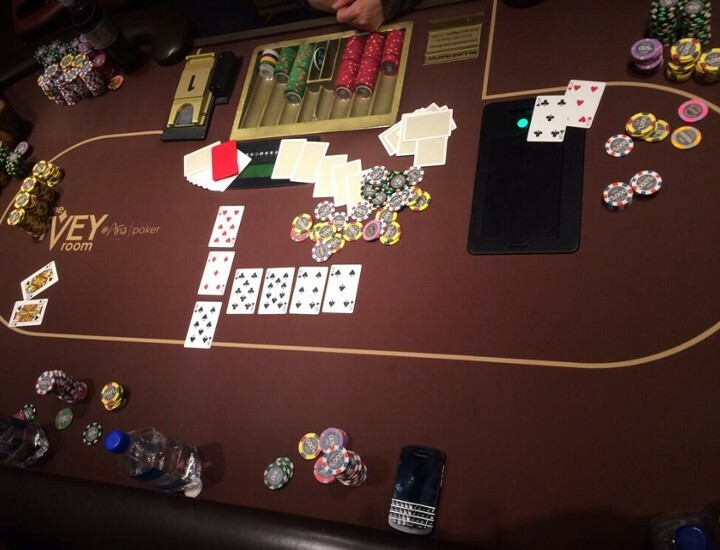 Check out this pic tweeted by none other than Jean-Robert Bellande of some absolute sickness that went down in the private room (Ivey’s Room) at the Aria. Bellande, holding QJss flops a flush against bottom set and by the river they have heaps of cash in the middle. Our best guess, by a simple eyeballing of the set up is that’s well over $100K. The turn is the 8 of clubs, seemingly harmless, then they run the river three times. #1. Another spade, but it’s an 8 – pairing the board giving the bottom set a full house. Strike one. #2. The case 5 – the set is now quads. Strike two. #3. Yep, another 8, this time a red one re-boating the set. Strike three. That run out puts this hand in the Bad Beat Diaries HOF. Think you can total up that pot? If so, let us know! Non-related poker buddies a 99% match. she’s been at the Rio, playing every day having only taken one day off the entire month. As the WSOP begins it’s decent into the One Drop and Main Event Amanda is simply hoping for a little extra sleep and to put some of her recent drama behind her. What drama you ask? Well, Amanda’s ex-boyfriend is one Ryan Eriquezzo. If that name sounds familiar it’s because he recently just made pretty popular headlines by throwing a temper tantrum in the Parx Poker room leading to a disqualification, which made for some good F5 fun. Last week, Ryan was induced into a rage again, this time on Twitter and had a heated exchange with Amanda about some unfinished business in their relationship – specifically: past money problems. Nevertheless, even though the very public online spat garnered lots of popcorn munching, Amanda has deleted her side of the very public argument and has moved on, opting to focus on the positives that can come from all of life’s little dramas and spats. Is a bracelet winner in need of some fast cash? 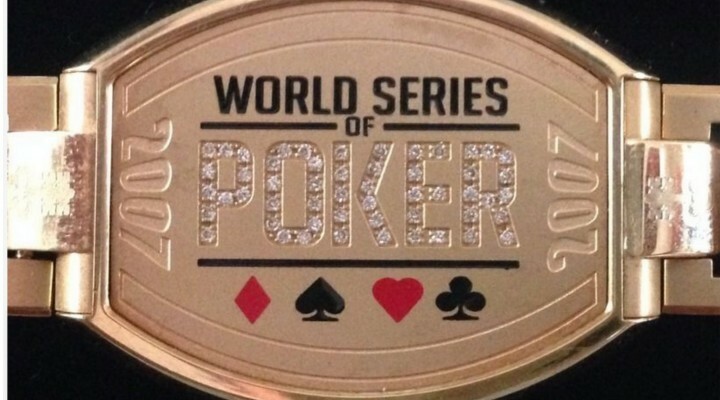 Why bother navigating a field of thousands when you can simply purchase a World Series of Poker bracelet on eBay! 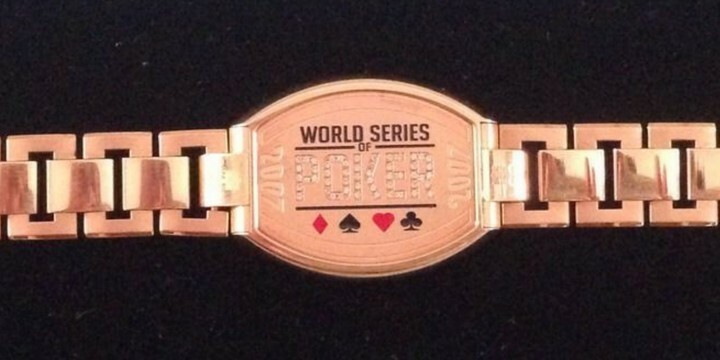 If you like things easy and wanna lie about your poker resume, you may be interest in this newly listed 2007 WSOP gold bracelet for only $7,000. So, whose bracelet is this? No clue. But according to the listing the used bracelet is in Las Vegas and eligible for free shipping! The seller is brand new, either new to eBay or having set up a new account and the seller name of “carcarodia“ doesn’t bring up very much on a Google search. Either way, if you want to own this bracelet to wear during the Main Event, you’re going to have to act fast – there’s only days left to place your bid! Anyone have any ideas on who is selling? Here’s the list of all the bracelet winners in 2007. Take your best guess and let us know who you think is selling their bracelet? Three-time World Series of Poker bracelet winner Vanessa Selbst will be attracting big-time attention in the Big One For One Drop $1M tournament starting this weekend. If it’s not for the fact that the Team PokerStars Pro is considered one of the best tournament players on the planet, if it’s not for the fact that she’s the only woman ever to register for the massive event, then maybe it will be for the unnatural selection of hair color Selbst decides on for the televised ESPN tournament. A tournament for the pros, by the pros. PokerNews asks top pros which they prefer PPC or WSOP ME. Want to be considered one of the best poker players in the world? If so, you have to play all the games and play them well. The $50K Poker Players Championship is the one time a year that the elite of the elite take their seats to try and prove that when it comes to all the games, they have the superior skill to have their name etched on the Chip Reese Memorial Trophy. Either that or it’s a big **** swinging contest. Since 2006, the Poker Players Championship is the small field, big buy-in tournament that just lets the pros be pros and vie for a coveted bracelet without all the bother of having to wade through an enormous field of luckboxes who only know how to go all in pre-flop. All their favorite games are represented, most of which aren’t played in almost any casino in the country. Of course there’s No Limit & Limit Hold’em, PLO, 7-Card Stud, Stud 8 or Better, Razz, Omaha 8 and 2-7 Triple Draw. That said, it’s still a super fun spectator sport. 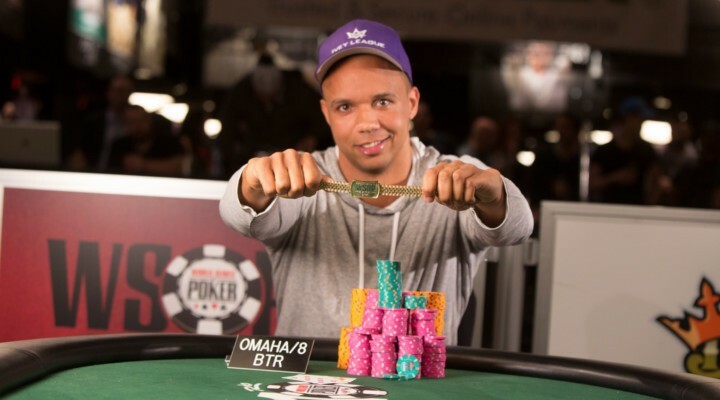 Take a look at the entrants list which includes some of poker’s marquee talent including Phil Ivey, Daniel Negreanu, Phil Hellmuth, Salty Joe Hachem, Jonathan Duhamel, Jason Mercier, Michael “The Grinder” Mizrachi and Scott Seiver. And that’s just at first glance. Speaking of that, Day 1 action wrapped up with Parx Poker ambassador Matt Glantz taking the chip lead into Day 2. Right behind him is another list of who’s who players as Dan Heimiller, David Benyamine, Steve Billirakis, Grinder and Shaun Deeb all carry top 10 chipstacks moving forward. The entire field is full of sickos and with this tournament being a 5 day tournament, there’s bound to be plenty of action and drama on the tables all week. Action resumes today at 2pm. Add Kelly to the long list of repeat bracelet winners this summer. Sure, Phil Laak and Kory Kilpatrick were at his final table, but PLO specialist Michael Drummond went into “godmode” when it counted. Mr. Drummond defeated the field of 452 in Event #42, the $5K PLO, to win his first gold bracelet and $541K+, one of the larger first place prizes of the summer. In other action 4-time WCOOP Champion Dan “djk123” Kelly became yet another in a long list of repeat bracelet winners at the 2014 WSOP. 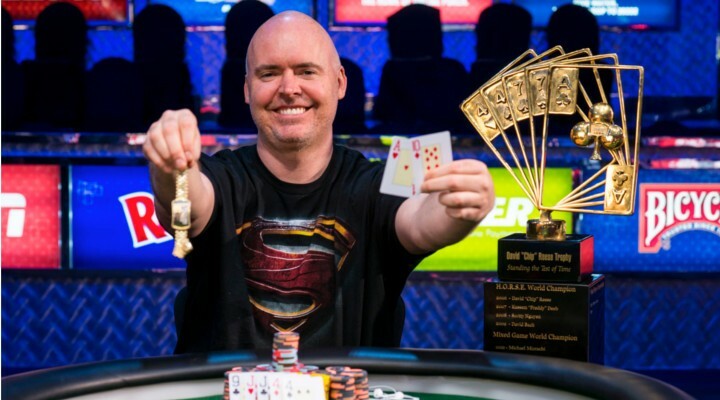 Kelly takes home nearly $200K for his victory in Event #43, the $1500 Limit Hold’em, as well as a coveted WSOP bracelet #2. Jeffrey Lisandro (7th), David Chiu (6th) and Brandon Shack-Harris (3rd) all made final table runs but it was Kelly that defeated the 657 person field. Next up for Kelly, chasing bracelet number 3 and hoping it doesn’t take another 4 years to score that one. Watch: Mr. Drummond talkin’ with PokerNews bout the “awesome” feeling of taking down one of the biggest PLO events of the summer, how he got lucky at just the right time and what he plans on doing with over half a million dollars. Watch: Dan Kelly looks spent as Caitlyn Howe tries to get a comment or two in the shortest winner’s interview of the series for PokerNews. The battle for Bertrand to make it to the World Series of Poker is well documented. He missed the first couple weeks with a passport snafu but after watching this video from Nolan Dalla and the WSOP you’ll wonder if ElkY was in a hurry to get to Las Vegas for the poker or the pleasures. So, like ElkY, you want to take your shot at the $10 Million first place prize in the Main Event? Of course you do! When in Las Vegas (or the whole state of Nevada actually) you can grind your way into the Main Event on WSOP.com. They’ve got it all – deposit bonuses, on-site assistance at the WSOP and a 25 Main Event Seat Guarantee on July 5th. So, check it out and own some people online to win your way into one of the biggest Main Events of all time. Doug has one ring that rules them all. Lee has a Hellmuthian way of giving away his trophies. Doug Lee, poker hobbyist, real estate dabbler and big-time punching bag for the forum dwellers on Two Plus Two talks with Thomas Keeling over at Bluff Magazine about his summer at the World Series of Poker, his “really advanced” poker lessons and the truth about the ring he wears on his right hand. 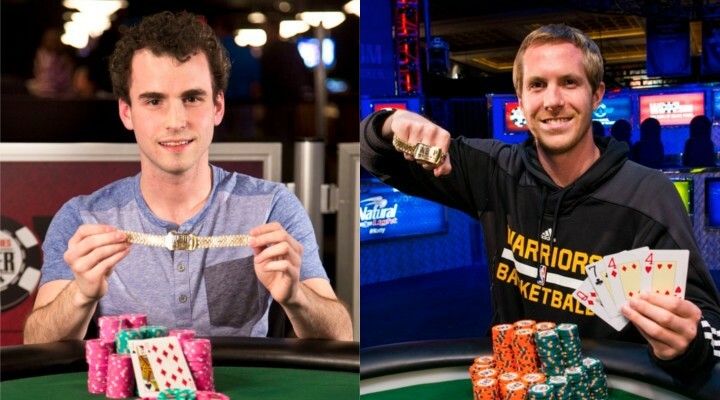 Many have thought that Lee was wearing his first WSOP Circuit ring but as Doug shares with Keeling, that the ring isn’t an advertisement for his on the felt success at all. The video that puts players (and viewers) in awkward spots. PokerNews likes to produce non sequitur videos every so often. In their Workaholic themed series, Sarah Grant and the video team spring random questions on unsuspecting poker pros with random results. In the latest edition of “Let’s Get Weird” the pros like Maria Ho, George Danzer, Dan Heimiller and more are asked what they would ask their future selves and it seems like they don’t have any real good questions to pose (at least not on such short notice). So, what would you ask your future self? Bonus: Like that last one? Great. Here’s some more of that. How much would it take to get you to NOT shower for a full year? Jason Koon probably has the best answer. Sarah Grant please say you are exaggerating yours. People seems to either love or hate Maurice, he couldn’t care less. Poker pro Maurice Hawkins is old school when it comes to table talk. He enjoys the psychological warfare that accompanies poker when you talk it up at the table and, maybe, he even tries to get under someone’s skin. This week, at a table in the $5K No Limit Event, he was chatting it up with Maria Ho and some other players (about the ladies) and, by his own admission, ruffled someone’s feathers. What this led to what an epic post on Two Plus Two, talk of a “poker clique” and a big online dustup over whether these poker pros are treating amateur players with the proper amount of respect. In this video where Hawkins talks with Bluff Magazine, from his perspective the table talk is all part of the game and if this individual wants to take to the internet to complain – that’s fine by him because he simply ignores the haters and cowards that do this stuff. More: Read the (now very extensive) Two Plus Two thread that talks about what went down with Hawking and Ho. Bonus: Maria Ho talks with Bluff about the poker clique. Poker pros judge on-the-felt fashion choices. Should there be a dress code in poker? Would you get dressed up for a final table? PokerNews sets out to get the thoughts of a few regular rounders to see what they think of the fashion choices seen round the Rio at the World Series of Poker. Daniel Negreanu, Ben Yu, Mike Sexton and Dee Tiller make the case for being comfortable while looking presentable. If you want to do something good for the game, try to up your dress code when the camera are on, otherwise as Sexton put it “be your own man.” Or woman. Drama filled event finally comes to an end. 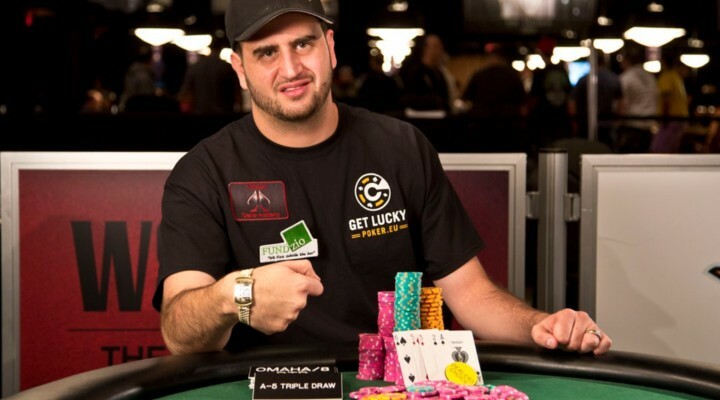 A familiar name in the poker world, Robert Mizrachi took down his 2nd career bracelet and $147K+ in first place prize money when he became the first ever winner of the popular (and controversial) Dealer’s Choice event. Mizrachi faced an elite final table, littered with bracelet winners including Frank Kassela, Daniel Idema and Bill Chen en route to finishing off the 419 person field. It’s safe to say that most people thought it would be the dealers themselves providing the hilarity when this event was announced, due to the variety of disciplines needed to be dealt, but it was mostly just Brandon Cantu who spiced things up with multiple rounds of pure drama. The event, which allowed players to pick from just about any game they wanted for a full orbit tested the skill of the Rio staff, both dealers and floor, and by all accounts they passed the test with flying colors. Watch: Bill Chen talks with PokerNews about a hand that needs to be recontructed. Watch More: Maridu address more angle shooting claims by, who else, Brandon Cantu.